From the Kitchen: Spinach Strata | Stahancyk, Kent & Hook P.C. 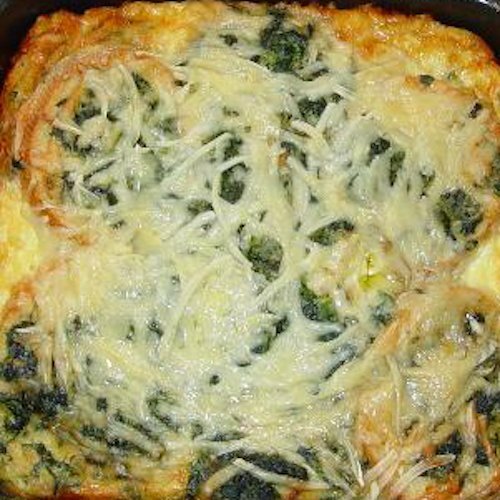 Aerial view of spinach strata. We recommend enjoying this delicious egg strata with brunch alongside roasted potatoes, vegetables and bacon! For the egg mixture, whisk together the eggs, milk, salt, pepper, nutmeg and mustard until combined; set aside. For the filling, sauté onion in two tablespoons butter on medium-low until translucent; add spinach, sun-dried tomatoes & salt until spinach has wilted; set aside to cool. Fill bottom of a buttered, heat-proof baking dish with bread cubes. Spread half of the filling over the bread layer. Add cheese. Repeat with remaining filling and bread. Cover with egg mixture, refrigerate overnight. Preheat oven to 350 ̊ F. Place dish in oven for 45 minutes or until firm. Broil for five minutes to brown top. Serve with vegetables, brunch or salad.